This page is dedicated to design and maintenance related details unique to the Wurlitzer Butterfly Grand. US Patent 2215097 is simply labeled as PIANO. The design in this patent is credited to Cyril Farny. The patent was filed April 19th of 1938. 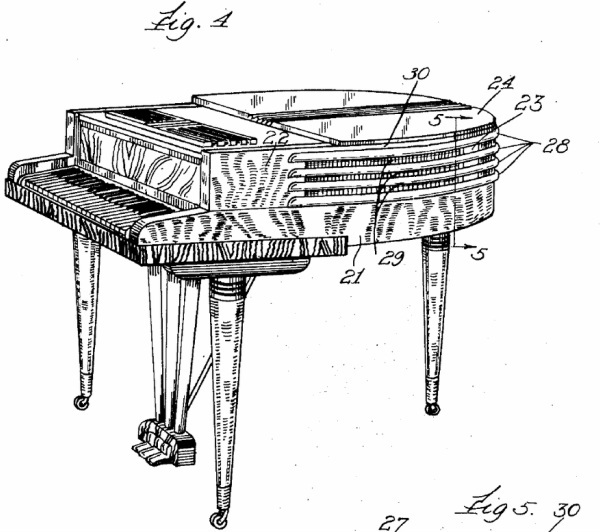 The main focus of the patent is detailing the various ways the piano can be ported to allow the sound to escape the rim without opening the lids. The piano actual case design is credited to William Zaiser as detailed below. Farny's early years were spent in Cincinnati, Ohio. The son of George Farny and Sylvia Wurlitzer, he prepared for college at Horace Mann and Morristown School. At Princeton, he was a member of the University Orchestra and Clio Hall. He lived at Craftsman Farms in Morris Plains. After graduation, Cyril began his career as V.P. and manager of the Piano Division of the Rudolph Wurlitzer Co. in DeKalb, Ill. The important object of the invention is to provide a relatively simple case adapted to permit the emanation of a satisfactory volume and quality of tone without necessitating the adjustment of any portions of the casing. In other words, a grand piano embodying this invention may be made with a fixed top so that it is not necessary to raise the lid over the strings in order to secure the proper tone; the side wall or rim is provided with openings in direct registration with the position of the strings and sounding board, so that the tone chamber formed between the sounding board and the lid is laterally open. William Zaiser was a prolific piano case designer. From the little information I have available, Zaiser was considered by many as the finest master of cabinet art in the world. An art he spent nearly 50 years developing. At some point, He was part of the design firm of Johnson & Zaiser, New York City, in which the original partners were Gerald Johnson and William Zaiser. ​Nearly all of the Wurlitzer patents for both spinets and the various butterfly cabinets around the timeframe in which we are interested in, were all created by him. Zaiser also designed pianos for the Aeolian American Corp., and others. Interestingly enough he had designed an upright for Steinway, just prior to filing the design patent for the Deluxe Model 88 Key Butterfly on Mar 14 of 1938 (Patent 110264). ​Farny's patent above is about a month later and recycled the Zaiser drawings for the intent of detailing the sound ports. The patent drawings are very close to what made it into production, exceptions being the lid props and the lyre assembly. Note the baffles lack any sound porting. The Butterfly style action as detailed in United States Patent 2157028 simply called Piano Action. Designed by Ralph W. E. Sperry, Wurlitzer Chief Piano Technician. This is the only patent drawing I can find that has the same cross-section as the "Flint Action". As you can see to the left and in the photo below, the hammer shanks are short with this action design. Replacing shanks and flanges could prove challenging. Rebuilding your existing action parts is the best option. Because of this short length, hammer blow distance and action geometry adjustments are even more critical. Over-strike or Under-strike conditions will provide a weak tone. Ralph Sperry was a nationally known piano designer. When the Great Depression hit he was living with his family in Ft. Wayne where he worked for the Packard Piano Company. The family moved to Nashville, Indiana where he and his wife found work. In 1934 he went to work for the Wurlitzer Piano Company. He designed their first upright spinet piano, the Wurlitzer 440, in 1937. His wife Portia managed the Brown County Folks Shop in Nashville, Indiana, and created the Abigail doll and wrote a children's book about her. 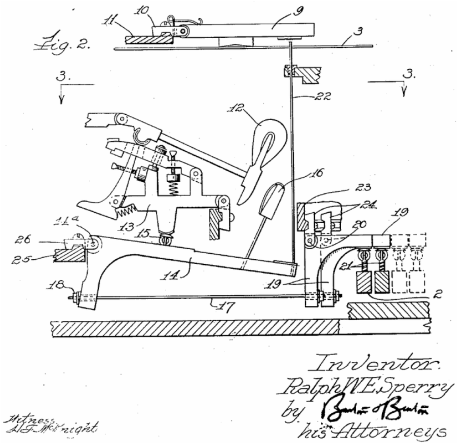 The patent drawing above shows this whippen style and action designed by Ralph W.E. Sperry. Patent was filed in Sept of 1937, but for a slightly different application. ﻿Update 4/17/15: During one of my recent online searches, I came across a 1934 Wurlitzer publication posted on http://antiquepianoshop.com. In comparing the action for the Style 46 piano detailed in this publication, it is identical to the Model 1411 butterfly piano action. This action is referred to as the "Perfected Flint Action" The Model 46 was four feet six inches long. Tonal research around the Wurlitzer models mentioned in this same publication is attributed to Dr. Hermann Fischer. Fischer designed the funny shaped "soundboard extensions" to transmit sound from the bridge into the open sections of the soundboard, as detailed in US patent "Piano sounding board" filed Sep 9 of 1933. This design was used on the butterfly piano soundboard. Another Ralph W.E. Sperry Contribution to the Wurlitzer Butterfly design was the called the "Tone Amplifier". Designed to bring out the tone on a smaller piano. The device consists of a metal flat bar that goes between the piano rim, running under the bass bridge, and point on the soundboard. A screw mechanism on top of the bridge can be adjusted to add or relieve tension on the soundboard, thus adjusting the tonal output. Unique fall board stop design. It took me awhile to figure out the stop mechanics of the fall board on this little piano. With the original hardware missing, I had to reverse engineer how this was done. The design of the fall board causes it to sit near vertical. Without the friction stop in place, the fall board is prone to dangerously slam on the player's fingers. The design is quite simple and easy to replace and/or adjust. The system consists of a wooden friction cleat (Photo 1) fastened to the inside of the fall board itself, and a clock spring steel ribbon that acts as a friction and pressure point for the fall board friction cleat when in the upright position. 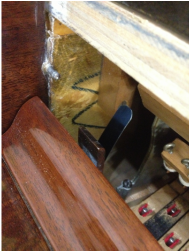 The spring ribbon is attached to the back side of the bass key block (Photo 2). The back side of key block itself has an angled relief cut into it, to adjust the angle and tension of the ribbon against the cleat. Once the clock spring ribbon is properly set, no further adjustment is required. The original ones seem to break or have been removed over time, as in this photo, with most people not realizing the need or function of it. I'll add a photo with the ribbon attached soon. Update: Since receiving my piano back from the restorer, I need to fabricate the missing stop, so I am adding photos of the process here. This first photo shows the remaining stump of the friction ribbon. These are typically broken. I believe the combination of the clock spring and possibly the change in the metal after drilling the hole causes them to stress crack over time. Notice the pins capturing the bottom edges and stoping it from rotating. The new piece is made from thin gauge blue clock spring steel, in my case some scraper material. The dimensions I have found that work well are 3/8" wide by 4 inches long. The most difficult part in fabricating this piece is drilling the hole in the clock spring steel. The hole needs to be just large enough for the tapered shaft of the wood screw to clear. I leave the hole smaller than the original, hopefully stressing it less. In this photo, the clock spring is installed and the key block is ready to be installed. If you notice, the spring has a natural direction that it wants to curve. You want this curve facing the keyboard. You can also manually give it more curve to provide greater friction. This is something you need to play with. You want the fall board cleat to push against the curve. This will be tested and aligned with the fall board installed minus the front board. This will allow you to visually see and feel the amount of tension the ribbon is putting on the cleat with the board raised. Remember that the fall board will not go back as far as it does now with the front board missing, so make your tension adjustment with that in mind. 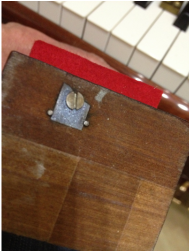 Here is a shot with the key block back in the piano and the relationship between the cleat and the tension ribbon. When you rotate the board to validate, it will look as though the ribbon is going to scrape the front of the fall board, but so long as your ribbon is long enough not to slip off the cleat, the cleat pushes it clear. The 4" length is a minimum. Much longer and it could touch the action frame. Again, here you'll have to validate and adjust as needed. I make sure I make the top edge of the ribbon a half circle, and smooth all rough edges with sand paper. Leaving anything rough will just gouge the wooden cleat and cause it to wear unevenly, preventing proper function. As stated previously, the damper pedal design leaves a lot to be desired. With the one-way torsion spring, you get a less than positive feel that tends to be mushy. I have a design I am working on to replace the short arm and torsion spring, but I just haven't gotten around to finishing it. In the interim, I added a simple fix to aide with positive response and feel. The first thing than needs to be addressed is any looseness in the assembly. 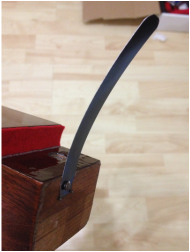 I bushed the pedal rod holes in the lyre with key bushing felt, which greatly reduces rod wander. This wander causes the pedal to feel sloppy because of the design of the push rod. As the rod wanders, the pedal travel changes slightly. The second thing I added was a spiral spring between the bottom of the case and the pedal arm. This is centered around the push rod. This pushes against the pedal arm on the return stroke, helping the overall pedal to feel more positive. The spring will look familiar to car guys. This a door panel spring that goes between the door panel and the the handle escutcheon. Interesting Facts: Some updated facts about the style 1411 Deluxe Butterfly. The earliest piano benches have a hinged side compartment rather than the seat lifting off for storage. I have become aware of a transitional bench between the two mentioned above. It has features of both, having the brass beauty ring on the legs AND the hinged side compartment. Thanks to Kathleen M. in Seattle. I have also become aware of what I believe to be a late bench that has a hinged top and overhang like a more modern bench, with the brass beauty ring legs and normal bench base. Updated 4/10/2015. * alternate damper pedal design to replace the mushy feeling torsion spring.